We’ve added several new tools for daily fantasy NBA recently, one of my favorites is the new Minutes Trend Tool. It takes a 3 game and a 10 game moving average of minutes played for each NBA player, and evaluates which players have been getting the best minutes as of late. Above everything else, minutes are the #1 indicator of fantasy production, so this tool is a great way to quickly find some of the top plays of the day. Below are some of my favorite plays of the day. CJ McCollum ($3,500) – With Nic Batum and Lamarcus Aldridge unlikely to play, other Trail Blazers will have to step up to replace the production of those two offensive powerhouses. CJ McCollum likely won’t start, but that may be better as he’ll maximize his time playing without Damian Lillard. His USG% last game was 27% and I expect him to play close to 30 minutes playing SG at the end of games. On top of everything he’s listed at SG, the lowest scoring position on FanDuel. He’s my top play. Dorrell Wright ($3,500) – Wright should have a massive minutes jump in this game. Portland has no other SF aside from journeyman Alonzo Gee unless they slide Arron Afflalo to the 3. Wright’s USG% shouldn’t be very high, but he should vastly outperform his price getting 35+ minutes in this game. Steven Adams ($5,500) – Most daily fantasy players will go with Demarcus Cousins or Enes Kanter tonight, but I think Adams is just as strong of a play. Cousins and Kanter are slightly overpriced and while Cousins has undeniably a great matchup, Kanter’s matchup is not as great as it appears, since he scores mostly offensive fantasy points. Adams, on the other hand, scores mostly defensive fantasy points, and should benefit from the Lakers sloppy offense. And his price is actually $400 less on FD than DraftKings. Cousins and Kanter are strong plays, don’t get me wrong, I just believe Adams could be a great GPP play. Demarcus Cousins ($9,600) – Remember how I said that Cousins was overpriced on FanDuel? He’s ridiculously underpriced on Draftkings. He goes against the awful 76ers team that allowed Boogie to score 39 points and 24 rebounds earlier this month (and, by the way, propelled my DraftKings lineup to 1st place in the 3-Ball and 1st in a WSOP Main Event qualifier). 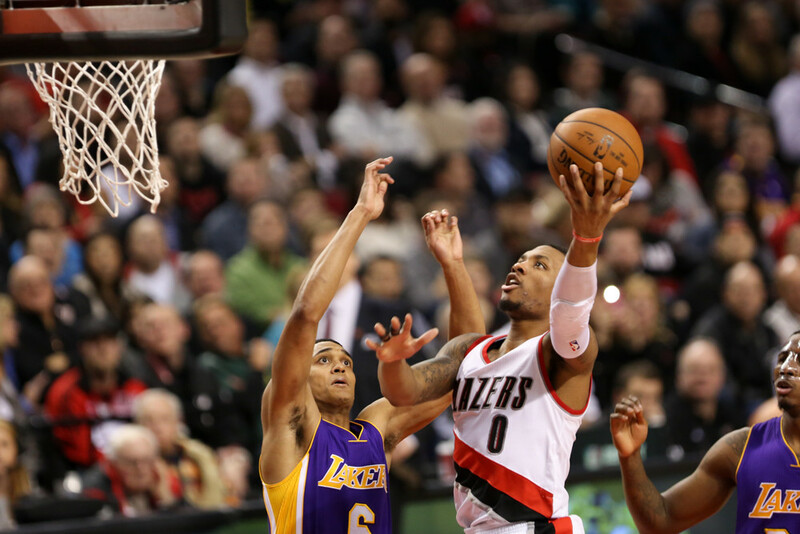 Damian Lillard ($7,600) – It shouldn’t take very many minutes for Lillard to put up fantasy points tonight. Without Lamarcus Aldridge, Lillard’s USG% should sky-rocket and his price on DraftKings is fantastic with a TRUE DIFF of $707. Is the matchup good? No. But as Danny beautifully illustrated in his article yesterday, nothing matters as much as USG% for guards. Monta Ellis ($6,300) – SG is much weaker on DraftKings with CJ McCollum listed as a PG, so we’ll have to stretch a little to find a good SG play. Ellis’ price has fallen hard recently but the absence of JJ Barea should help Ellis bounce back. Devin Harris, who usually takes backup SG minutes should play backup PG minutes instead, leaving essentially no one to play SG aside from Ellis. Without Barea in the Mavs previous game, Ellis played 37.4 minutes, his USG was 28%, but he fell unnoticed because of shooting 18% from the field. Don’t forget about him tonight.